The heady fragrance of the superior white truffle of the Molise region and the natural taste of olive oil become a cult for high-quality gastronomy. Excellent on intensely flavoured accompaniments, perfect for seasoning meats, game, vegetables and stuffings. Thin slices of truffle, the unmistakable dark colour of the black summer truffle makes the presentation of high quality gastronomic dishes interesting. Perfect on pizza, ideal for pasta dishes, carpaccio and boiled or roasted white meats. Ingredients: black summer truffles (tuber aestivum Vittadini), olive oil, salt, aromas. Prepared in olive oil, rich flavour, intense aroma. Ideal in hors d’oevres, omelettes and pasta dishes and white meats and salads. 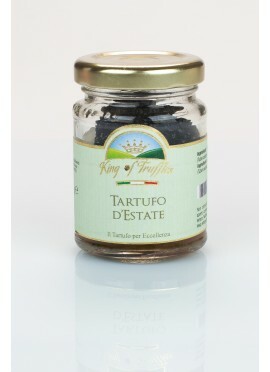 Ingredients: black summer truffles (Tuber Aestivum Vittadini) 70%, olive oil, salt, aroma. The intense and harmonious aroma of the white truffle meets the velvety and delicate taste of porcini in a perfect marriage and embrace lovingly demanding dishes such as pasta, tasty fillings, sauces intense aroma to meats and fish. Also perfect for canapes and voulevant. Ingredients: mushrooms (boletus edulis) 72%, white truffle (tuber magnatum pico) 3%,olive oil, salt, aromas. Chopped wild mushrooms with delightfully tasing black truffles. An excellent of cooking cream. Delicious accompaniment to meats and eggs. Delectable on toasted slices of bread, canapès and crackers. Can also be used as a filling for tortellini and ravioli. Ingredients: mushrooms (agaricus bisporus), olives, summer black truffle (tuber aestivum Vittadini) 5%, salt, aromas. Finely chopped artichoke hearts in olive oil. Excellent as a filling for canapès, pizzas and focacce and as, a condiment for pasta dishes, an accompaniment to game and poultry or a base for delicious sauce. Ingredients: artichokes (min.65%), olive oil, olives, summer black truffle (tuber aestivum Vittadini) 5% salt, aromas. Newcomer among our products. The truffle Summer was designed and created for those who want to have a product, such as fresh, all year on their table. The truffle freshly harvested in the woods, is thoroughly washed, dried and put in a jar, preserving, in addition to the smell, even the taste of a truffle freshly harvested. Ingredients: black summer truffle (Tuber aestivum Vitt. ), Water, salt. A simple product like the salt meets the king of the forest: the black truffle by King of Truffles. Ingredients: basil 27%, sunflower oil, potatoes, cheese (milk, salt, rennet, lysozyme egg protein), pine nuts, black summer truffle (Tuber Aestivum Vitt. - origin Italy) 3%, aroma. Ideal in pasta dishes, to enrich meat, vegetables and bruschetta. Ingredients: Honey, white truffle (Tuber borchii Vitt. - origin Italy) 2.5%, white truffle (Tuber magnatum Pico - origin Italy) 1%, aroma. Ideal in combination with fresh / medium-aged cheeses and lard or for dessert. Ingredients: Honey, black truffle 0,5%, (Tuber melanosporum Vitt. -origine Italia), aroma. Ideal in combination with aged cheeses and lard or for dessert. Ingredients: durum wheat semolina, fresh eggs (33.4%), white truffle (Tuber albidum Pico) 0.8%, aroma. Ideal in combination with Delicious with white truffle King of Truffles, with fresh truffle and with butter with black summer truffle. Ingredients: durum wheat semolina, champignon mushrooms (Agaricus Bisporus), black summer truffle (Tuber aestivum Vitt) 1%, aroma. Ideal in combination with fresh truffle, with butter with black summer truffle and Black Truffle Pearls King of Truffles. Ideal in pasta dishes, meat and eggs.